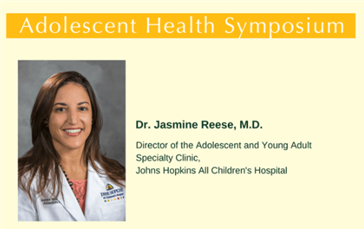 The Shorecrest Community Association (SCA) was pleased to welcome an expert panel from the Adolescent and Young Adult Specialty Clinic at Johns Hopkins All Children's Hospital for an evening symposium on adolescent health led by Clinic Director Jasmine Reese, M.D., M.P.H. Joining Dr. Reese were Clinical Dietitian Brenna Denhardt, child life specialist Kat Leibbrandt, and psychologist Dr. Val Valle from the JHACH Institute for Brain Protection Sciences. Shorecrest representatives Don Paige, Head of Upper School, and Courtney Ellis, Upper School Counselor, were also present. At this very special event, experts covered both physical and psychological development and changes, and identified risky behaviors and how to handle them. The content was geared toward families with tweens and teens. Dr. Reese and her team have addressed both Upper and Middle School students at different assemblies this fall regarding the dangers of vaping, e-cigarettes, and other adolescent health issues. Registered Dietitian Nutritionist Brenna Denhardt assesses the nutrition needs of infants and children, provides therapeutic interventions to promote health, manage disease, and prevent chronic illness, as well as provide family-centered nutrition education. Brenna completed her undergraduate studies in nutrition and dietetics at Purdue University and her dietetic internship at Montana State University. After completing her internship, she worked as a clinical dietitian at a hospital in Missoula, Montana, focusing on oncology nutrition. She subsequently moved to St. Petersburg and has been working at All Children’s Hospital since June 2017. During this time, she has gained a variety of experiences in clinical pediatrics, including inpatient and outpatient populations. She works with children and families, providing nutrition education and interventions for many types of illnesses including obesity, eating disorders, gastrointestinal disorders, malnutrition, kids with feeding tubes, and more. Brenna hopes to pursue a specialty certification in eating disorders. Kat Leibbrandt, B.A., B.S., CCLS, is a Certified Child Life Specialist currently working in the Per Diem role as a member of the Child Life Department at Johns Hopkins All Children’s Hospital. She is a graduate of the University of South Florida in Tampa holding degrees in Health Sciences and Health Communications. She completed her practicum at St. Joseph’s Children’s Hospital in Tampa, her internship at Tampa General Hospital, and has been certified in Children’s Disaster Relief Response. Kat was the primary Child Life Specialist on the General Pediatric and Subspecialty Unit for approximately two years prior to entering the role of Per Diem at which she provides support to all units of the hospital including inpatient, outpatient, and critical care. Kat has spent the last 5 years working closely with children and teens in the community through her own nonprofit, the IamMore Foundation, promoting positive self-image to those impacted by chronic diagnosis or physical disability. Additionally, Kat provides support to at risk teens in the refugee community of Tampa weekly. Dr. Reese is the director of the Adolescent and Young Adult Specialty Clinic within the Division of General Pediatrics and Adolescent Medicine. She is also the adolescent medicine rotation director for the pediatric residency program. She joined the Johns Hopkins All Children's medical staff in 2016 and serves as a full-time assistant professor of pediatrics in the Johns Hopkins University School of Medicine. Dr. Reese earned her medical degree from Ross University School of Medicine. She completed her pediatric residency at Phoenix Children’s Hospital and an adolescent medicine fellowship at the University of Alabama at Birmingham. JHACH psychologists Dr. Val Valle specializes in sports and performance psychology in the Johns Hopkins All Children’s Institute for Brain Protection Sciences. She joined the hospital staff in 2017. Dr. Valle earned her doctoral degree from Arizona School of Professional Psychology. She completed a pre-doctoral internship at the University of California-Riverside and a postdoctoral fellowship at the University of New Mexico. She also completed practicum internships at Psychological Counseling Services and Sierra Tucson and a practicum sports psychology internship at Grand Canyon University. Dr. Valle’s clinical interests include developmental concerns and stressors of athletes and high stakes performers.